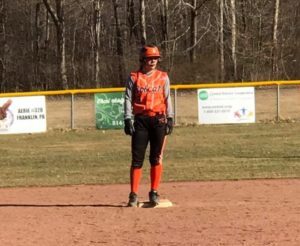 (By CSZ Sports Writer Kenn Staub) The Clarion Bobcat softball team opened the season on Wednesday, March 27 with a 2-1 victory at Franklin behind a stellar pitching performance by Kaitlyn Constantino. Dominant in the circle, Constantino surrendered but two hits and walked none in her seven innings of work, striking out 15 along the way. Jordan Best stands on second in the sixth inning. She would score the game winning run from there. Franklin got on the board first, taking a 1-0 lead after an inning of play. The Knight’s lead-off hitter singled, went to second on a sacrifice, and scored on a one-out error. Constantino then recorded her first two strike outs of the day, stranding the Franklin runner. Clarion tied the game in the third. Constantino was hit by a pitch, then stole second. She scored when a hard ground ball by Brenna Campbell was misplayed at second base. Meanwhile Constantino was holding the Franklin batters in check, striking out the side in the second, two in both the third and fourth, and three in the fifth. Clarion broke the deadlock in the sixth. Jordan Best was hit by a pitch and then stole second. She crossed the plate when a ball Tori Vega put in play on the left side was mishandled at third, giving the Bobcats a 2-1 lead. Neither team scored for the remainder of the game, with Constantino striking out four more in the final two innings. Clarion managed three hits, singles by Lindsey Kemmer and Peyton Simko and a double by Carly Best.